Fill out this form to apply for the 2015 Inspired Leadership Challenge. I hereby agree that all information on this form and attached forms is true and correct to the best of my knowledge and give permission for my child to attend the Inspired Leadership Challenge at SWOSU (February 28, 2015). I understand that if my student should be dismissed from the program or chooses to leave early for any reason, I am responsible for his/her immediate transport home. AUTHORIZATION FOR MEDICAL EMERGENCY TREATMENT: If your child sustains a non life-threatening injury, the law requires that a hospital have parental consent before beginning treatment. This form allows you to give the necessary permission, even if your child is under the care of another adult. 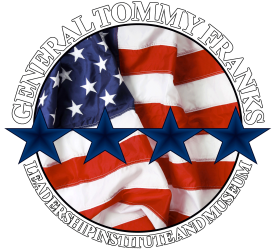 I (we) the undersigned parent(s) or legal guardian(s) of the minor listed authorize the staff of the General Tommy Franks Leadership Institute and Museum to provide consent for emergency medical care for my child named above if unable to reach me. AUTHORIZATION TO UTILIZE PHYSICAL LIKENESS, NON-UNION PRODUCTION: I expressly grant to the General Tommy Franks Leadership Institute and Museum and to their employees, agents and assigns, the right to photograph and videotape me and use my picture, silhouette and other reproductions of my physical likeness (as the same may appear in any still camera photograph and/or videotape) in and in connection with the exhibition on television, the internet, cassette, DVD or otherwise, of all the television shows, conventions, “clips” promos, magazine, newspaper articles, etc. in which my participation is included and in which the same may be used or incorporated and utilized throughout the world, and also in the advertising, utilizing and/or publicizing of any such image, but not limited to television. These groups shall have the ability to edit the program/video as it so requires. I further give these groups the right to reproduce in any manner whatsoever any recordation made by said company of my voice and all instrumental, musical, or other sound effects produced by me. By entering your names and submitting this application, you agree to the above terms.